VICTIMS OF DOCTRINE—BECAUSE ‘THE BOOK’ SAYS SO! Later on in my career, I finally understood that doctrine is merely a guide to activity and action. It sets out a way for us how to do things in certain situations but does not prescribe what we must do. I would later discover that ‘guide’ is the operative word. However, I often found that many of my colleagues believed that our doctrine was written in stone…”Because ‘the book’ says so…” No deviation from the doctrine was allowed or, at times, even tolerated. I had no compunction in deviating from ‘the book’ if I thought my actions and orders would save lives and result in success. I could always face the music later—and I often did. But, I fear we have become so caught up by what ‘the book’ says, that we set ourselves up for failure time and again. This strict adherence to ‘the book’ gives us a very blinkered and rigid approach to conflict and war. Guided by ‘the book’, we consistently repeat the same mistakes until they become ‘muscle memory’—and simply the way we do things. In the process, we have become dogmatic, and predictable, thus denying ourselves agility, balance, flexibility, initiative, surprise, and speed of action/reaction when we need it most. Yet, despite the casualties, we seem determined to grasp defeat from the jaws of victory. For decades now, African armies have been using outdated Western and Eastern doctrines and this is marked by a record of very little success on the continent. Whereas these doctrines were, at a time relevant, I fear they no longer are. The doctrines ascribed to by many Africa armies are unaligned, and have become stagnant and in many instances, irrelevant. Of course, certain elements may retain relevance but the time has come for African armed forces to revisit their doctrines and, with a very sharp knife, cut out what is no longer applicable or relevant—and replace it with doctrine that is applicable, realistic, and relevant. We need to shake off the outdated doctrinal shackles of World War II, some of it unconnected with todays’ high tempo, technology-driven warfare that is shrouded in uncertainty. Yet, these antiquated doctrines remain in use and remain unrevised despite many important lessons having being learned. And so, we continue to fail the National Security Strategy and ultimately, the National Strategy. When assessing the inability of many African armies to perform effectively in the field, it becomes clear that there are numerous doctrinal failures and mismatches. There is nothing wrong with the quality of manpower, as long as they are trained, equipped and well led. Despite a measure of training, victory remains elusive as tactical successes are seldom, if ever, translated into operational or strategic successes. 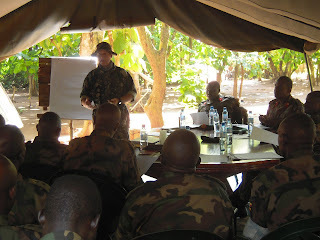 Currently, the doctrines in use by many African armies are not aligned with the National Security Strategy, nor with the National Military Strategy and the subsequent campaign strategies make no allowance for complex AOs, have little regard for the environmental impact on operations, incorrectly assume all troops are trained to a high level, do not make allowances for a lack of equipment, take no cognisance of the threat or enemy, and so forth. Being fortunate to be given latitude by some African armies, I have come to realise that doctrine needs to be simplified, made relevant and realistic, and then imprinted on the minds of soldiers as soon as possible. Simplifying doctrine and teaching it to troops at a very early stage of their training has numerous advantages. Most importantly, it teaches them how planned combat operations will unfold, and how forces are integrated into a unified units and sub-units, and how and why their actions will support the combat operations to achieve the commander’s intent, and so forth. 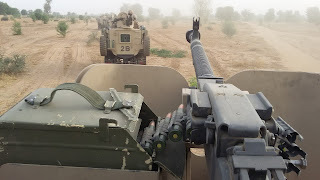 Understanding a simplified doctrine that is devoid of ‘management’ terms, outdated and unconnected approaches, cumbersome, and irrelevant information has, in my experience, had a marked difference in how troops approach their missions and how they fight. I have witnessed that when doctrine is explained to them, a visible understanding occurs—and it then shows in how they approach combat operations. But, we remain self-deluded with our doctrine, believing it is written in stone and therefore not subject to adaption, discussion or change. As long as we do what the outdated ‘book’ says, we will remain victims of our doctrine as we will become what we want the enemy to become—confused and predictive. The current crisis in command many African armies are faced with can be traced back to the manner in which current and future commanders are identified and prepared for their missions and roles. Commanding and leading soldiers—including airmen and sailors—in both peacetime and conflict is not a game to be played for personal gain. When it comes to the national security of a country, difficult choices need to be made. When it comes to appointing those who are charged with maintaining the security of the state, even more difficult choices are called for. The old adage ‘There are no bad soldiers, only bad commanders’ certainly holds true for many African armed forces. Soldiers can only do what they are trained and equipped to do—if they are correctly commanded and led. When command and leadership is lacking, soldiers become confused and lacking in direction and discipline, morale is negatively impacted, orders are questioned and disobeyed, and the combat efficiency of the armed forces rapidly deteriorates. But command leadership is not ‘business management’. Whereas ‘command’ ought to be emphasized in the armed forces, I have met commanders who are, sadly, unable to exercise effective command. Not because they don’t have the ability or personality to do so but rather because they have been appointed by a system that is failing them, the armed forces and the country. Their inability is then amplified by being taught ‘management techniques’ and thereby softening the already failing approach to command. This ‘business’ approach to military operations has resulted in some spectacular failures across the continent. It has also added to a deepening sense of self-delusion that needs to be exposed. The armed forces cannot be equated to a business enterprise where management techniques hold relevance. Commanders are faced with vastly different situations and decisions than managers of business enterprises. Whereas ‘command’ gives those who are entrusted with it the opportunity to use power for the good of the state, many use this as an opportunity to abuse power for personal gain and satisfaction. Abuse of power thus becomes entrenched and junior officers and NCOs follow the example and trend of abusing their power while ignoring their responsibilities. Commanders need to realise that they command at the behest of the state and not for themselves. Commanding for themselves has resulted in numerous moral failures that include personal enrichment, corruption, and the misuse of state assets, to name but a few. This immoral view of command permeates through to the lower ranks encouraging moral failures amongst junior officers and NCOs. After all, this is the example their senior commanders are setting for them. Command has also increasingly become synonymous with bullying. Impacting severely on the current crisis in command many African armed forces face is the lack of selection, training, further education, and competence of commanders. To rectify this troubling situation, more promotions take place adding to an already top-heavy command structure. As and when the command structure, ie the officer corps, exceeds more than 10% of the force level, command problems are dramatically increased. (This has historical been proven on numerous occasions). Whereas promotions ought to serve as an incentive based on competence and results, command positions are instead given to political appointees where tribal, race, language, religious or ethnic considerations are valued over competence. Thus when defence cuts are implemented, or budgets constrained, the command element remains in position, at all costs and instead, troop levels are cut, training neglected or critical equipment left to rot. Budget cuts also often see the command element increasing at the expense of combat readiness. Without effective, disciplined command that follows the National Military Strategy and for the good of the nation and its people, an armed force has the potential to become a leaderless group of armed men. This, in itself, poses numerous grave dangers to the state and its citizens. Regardless of thoughts to the contrary, African armed forces are currently facing a crisis in command that needs to be rapidly rectified. If not, our armies will continue to remain at a disadvantage.